Current studies in our laboratory are designed to determine the frequency of genotoxic responses induced in lymphocytes isolated from Fischer 344 rats. To evaluate the effect of a model compound, N-ethyl-N-nitrosourea (ENU), on the cell-cycle distribution of spleen lymphocytes, 8-week old, female Fischer 344 rats were injected i.p. with ENU and sacrificed 1, 2, 4, and 6 weeks afterexposure. Four replicate cultures per dose per exposure period were established and cells were cultured for 66 hr. Colcernid, an agent which blocks cells in mitosis and induces an accumulation of cells in the G2 + M peak, was added to two of the four cultures as a positive control. After a 3 hr incubation, the cells were harvested, the nuclei stained with propidium iodide, and the DNA content of the individual nuclei was quantified by flow cytometry. As expected, exposure to Colcemid resulted in an accumulation of cells in the G2 + M phase of the cell cycle, which was accompanied by a decrease in the Go + GI population. The increase in the G2 + M population was significant (p < 0.05) in cultures of lymphocytes assayed at 4 and 6 weeks after exposure. The eflect of increasing ENU concentratiorl was an increase in the percentage of Sphase cells (p =0.05) and a decrease (p < 0.02) in the percentage of G0 + G1 cells. This finding was observed only in those lymphocytes isolated 1 week after exposure. 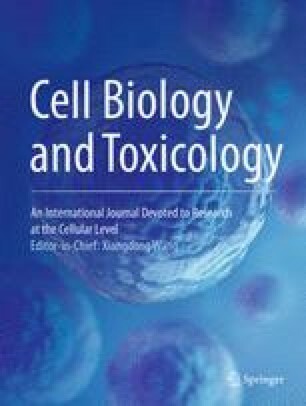 These findings indicate that flow cytometric analysis of the distribution of cells within the cell-cycle may provide insight into the eflects of toxicant exposure on mamnzalian cells.